A couple of weeks ago, I was at a conference speaking to some students on passion and success. It was one of my favorites because of the number of questions being asked by the students. How often do we usually have those talks where the open forum isn’t dead air? One of my favorite questions was one that we hear often, so often that we often know what the answer usually is. One of the students asked me “How do you know if you’re already successful?”. Answers we usually hear include answers like “when you earn your first million” or “when you start your business and it can sustain itself”. My answer wasn’t something that students nowadays hear a lot from motivational speakers and coaches. How often do people define success only as career success? Today’s dictionaries will usually give us a definition for success like “the attainment of wealth, position, honors, or the like.” But how often do we see people gain career, financial and reputation success only to fail at things that matter most? 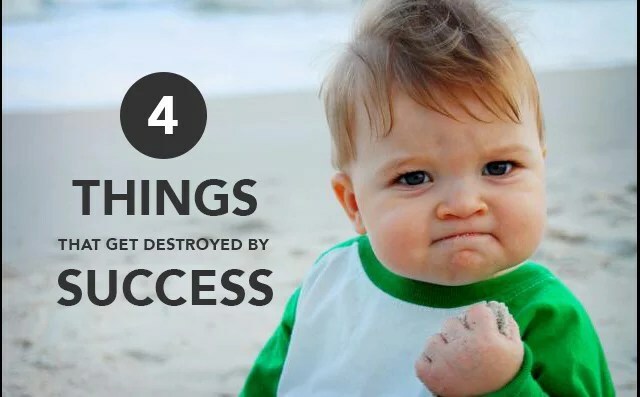 Here are four things that we should be just as or even more successful at aside from career. I like what Steve Murrell said, “We must refuse to sacrifice family at the altar or career success”. How many people do you know gain so much power and influence in the office place only to come home to kids who will not listen to them, or wives who only wait for your next pay check? Yes, I understand how we all work to provide for our family, but there always comes a point that we should stop trying to earn more, get more promotions when we know we can’t spend that much time with our kids anymore. Ralph Waldo Emerson, a true leader and a successful one, once said, “A true man’s wealth is his health”. The more we grow in our careers, the more we should grow in our health. Many of the people I look up to today are people who achieve so much with the time they have yet still keep time to stay healthy. People like Ferdie Cabiling and Joey Bonifacio, these men really know how to be successful. Not only with career, but also with their health. It’s common for people to want to be millionaires by 40, but how many aspire to be illness-free at 60? Did you know that you can be both a success and failure in the work place? I came this nice graphic showing the difference between a boss and a coach. Everyone wants to be a coach, not a boss. The biggest difference between a boss and coach is their value for relationships. Bosses will always value results over relationships, coaches value relationships and people over results. Don’t get me wrong, I’m not telling you to forget about sales targets, production quotas and company numbers. It would be interesting to know however that as we value and trust people more, they get a better feel and ownership of work, and we in turn become more excellent and successful in the workplace. This might not go for every situation, but more often than not, work will not always equate to the impact you want. I have a friend, whom I like to talk a lot about. His name is DJ Ong. DJ is, well, a DJ and he produces music. However he doesn’t do it for a living. He’s actually a writer. But everytime he gets the chance he makes music, and boy does he make great music! It’s the way he impacts community. But he never gives it up just to become a better writer. He always finds a balance between both. It’s great that we can be effective and successful in our careers. By all means, let’s all want to hustle more and build more companies, get better raises, climb that corporate ladder. But remember that career success is not the only true measure of success as a whole.